Ronald Assas' frustration with shoplifters came to a head the day he watched a man slip two bottles of wine under his shirt and run out of an Akron, Ohio, supermarket. Assas, the store manager, sprinted out the door in pursuit of the thief. Unable to catch the man and unsure what he would have done if he had caught him, Assas returned to the store. He commented that anyone who could figure out a way to deter such thieves would make a fortune. One of those who heard his remark was his cousin, Jack Welch. Welch was already working on electronic tagging of products, and he took up Assas' challenge. Several weeks later, Welch returned to the store with a 2 ft (61 cm) square of cardboard with a large foil tag taped to it, along with some bulky boxes filled with electronic components he had assembled in his garage. He showed Assas how an alarm would sound if someone tried to carry the tag out the door between the boxes. A couple of years later, Assas founded Sensormatic Electronics Corporation, which still holds a 65% share of the worldwide electronic security market. Since they were first marketed in 1966, antishoplifting tags have become so popular that a billion dollars worth of them were manufactured last year to combat thefts that cost retailers 10 billion dollars a year. Using the tags is one of the most effective deterrents available to store owners. Some tags are hard tags or buttons that are attached to merchandise with pins that can be removed only with a special tool; these tags can be reused repeatedly by the merchant. Other tags look like thick, plastic labels; these are not removed from the merchandise during purchase, but they are electronically deactivated so the product can be taken from the store without activating the alarm. Tags of this type are disposable, although they can be reactivated if the purchased item is returned to the store for exchange or refund. Within the retail industry, the devices are generally known as security tags or Electronic Article Surveillance (EAS) tags. The technology favored for modern tags involves a set of gates that transmits pulses of a low-range radio frequency. Inside each security tag is a resonator, a device that picks up the transmitted signal and repeats it. The set of gates also contains a receiver that is progranmned to recognize whether it is detecting the target signal during the time gaps between the pulses being broadcast by the gates. Sensing a signal during these intervals indicates the presence of a signal being resonated (rebroadcast) by a security tag in the detection zone. When this occurs, the gates sound an alarm; in some systems, the alarm sound is accompanied by a flashing light. 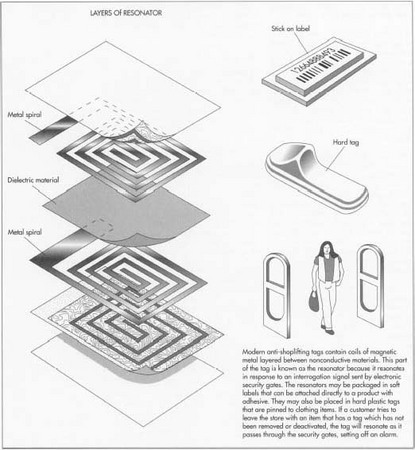 For the first 20 years of their history, security tags used swept radio frequency (swept-RF) technology, which relied on a semiconductor diode to retransmit a high-frequency radio signal from the detection gates. Although the tags worked reasonably well, they had certain limitations. For instance, the older devices could be defeated by placing tagged merchandise in foil-lined pouches that could block the microwave signals, and they were not very reliable when used to tag metal or foil-wrapped products. Furthermore, widely spaced antenna gates (more than 4.5 ft[l.4 m]) were not effective, and false alarms could result when the deactivation process failed. In the mid-1980s, acousto-magnetic technology was developed to overcome certain limitations of the swept-RF devices. These systems operate with low frequency radio waves that are not blocked by metal foil wrappings. Tags contain coils of an appropriate magnetic metal that resonates in response to the interrogation signal. Although these types of systems are somewhat more costly than those using the older technology, they work more reliably over wider detection zones. Hard tags that are commonly attached to clothing items are difficult to remove without damaging the product. Several innovations have been introduced over the years to make security tags more effective. For example, ink tags, which were developed in the early 1980s, contain small vials of dye that break if the tag is forcibly removed from the garment. The resulting spillage not only spoils the tagged apparel, but it stains the thief s hands for easy identification. Another design causes a tag to sound a loud alarm if it is tampered with. Disposable, label-style security tags are becoming increasingly popular, particularly when the tags are inserted inside the product or its packaging by the manufacturer. This "source tagging" makes the devices less accessible for tampering or premature removal, as well as eliminating the time spent by retail clerks to attach and remove tags. Hard tags are formed from durable plastic, and the pin used to attach the tag to the product is made of nickel-plated steel. Disposable tags are formed from more flexible plastic, such as polypropylene. Conductive and non-conductive components of the resonator units include such materials as copper, aluminum, cellulose acetate, acrylic, and polyester. The following description applies generically to reusable hard tags; details may vary among manufacturers. Disposable security tags are manufactured in a similar manner, except that the resonator is sealed inside a flexible plastic envelope, which may be backed with adhesive. 2 There are several ways a resonator can be made. One technique involves laminating copper or aluminum coils onto a web of nonconductive material. This is done by passing the adhesive-coated base web between rollers that apply a spiral-shaped mask of non-sticky material, after which the web passes through a dryer to set the mask. A thin, flat strip of metal is then laminated to the uncoated (sticky) portion of the base web. The laminated strip subsequently passes between a backup roller and a cutting roller, which cuts through the metal but not the base web, disconnecting the individual metal coils from one another. This masking and laminating process is repeated, adding a layer of web with metal spirals atop the first layer so that the two layers of spirals are face to face, separated by a layer of dielectric (nonconductive) material. Finally, the laminated strip is cut into individual resonators that can be inserted into security tags. Another type of resonator is made by winding insulated (encased in plastic) copper wire into a flat spiral of about a dozen loops, with the ends of the wire connected through a diode. One company makes a button-shaped tag that can operate with a very small-diameter coil because the wire is spiraled into a cone shape. product at the retail store. There are numerous designs of clutches, but one example is a metal plate with a small hole in the middle. The hole is too small for the pin's shaft to pass through unless the metal plate is flexed to enlarge the hole. Once the pin is inserted, the plate flattens, and the minimized hole fits around a grooved section in the shaft of the pin. To release this grip, the sales clerk inserts the tag into a magnetic device that flexes the clutch plate, allowing the pin to slide free. Another example of a clutch type is a ring of tiny balls that encircle the pin, with a spring mechanism pressing the balls into a groove in the pin's shaft; a magnetic deactivator retracts the balls from the groove, releasing the pin. Still other tag designs use a mechanical deactivator that inserts a probe into the tag to physically disengage a locking device. 4 With the resonator and clutch assemblies in place, the upper and lower portions of the plastic tag casing are attached together. They are sealed by heat or welded by ultrasound. Finally, the completed tags are counted and boxed for shipment. Concealing antishoplifting tags inside a product's package is becoming more prevalent, as some shoplifters manage to remove or disable visible tags. In fact, some label-style tags are so small they can be hidden within the seam of a garment while it is being manufactured. The next generation of security tags will contain "smart" chips. Using radio waves, various people throughout the wholesale and retail supply chains will be able to read and write to integrated circuits within the tags. Coded information about the dates and places of manufacture and purchase could remain with an article indefinitely for warranty or refund purposes. The technology developed for antishoplifting tags has found other applications too. For example, some hospitals include tiny security tags in identification bracelets to alert the staff if a senile patient wanders out of his or her room. "Let Shoplifters Beware: The Macbeth Solution." Discover, October 1986, p. 14. Ryan, Joseph, Jr. "Antishoplifting Labels." Scientific American, May 1997, p. 120. Schmuckler, Eric. "Attention, Shoplifters!" Forbes, November 14, 1988, pp. 258-59. Sieder, Jill Jordan. "To Catch a Thief, Try This." U.S. News & World Report, September 23, 1996, p. 71. "Just the Facts." Sensormatic. http://www.sensormatic.com:80/html/news/execsum.htm (20 May 1997). "United States Patent Number 5,494,550." Patent Server. http://patent.womplex.ibm.com (20 May 1997). "United States Patent Number 5,528,914." Patent Server. http://patent.womplex.ibm.com (20 May 1997). You mentioned that there are deterrents that can thwart a foil pouch that still use frequency waves. I wasn't aware that you could disable the effectiveness of a faraday cage which a foil pouch is. Increasing the thickness of the cage would overcome any increased signal strength unless you want to heat people up like a pizza pocket as they enter and exit the store. And thieves could use materials like carbon fiber cloth without resin to act as a faraday cage that only death rays could penetrate.